Solum Ambiental is a company that aims at the processing and cogeneration of energy by means of solid wastes of any class, based on an innovative technology, not harming the environment, and with an economically-feasible and highly-efficient destination. Solum also markets equipment for the processing of solid wastes and services for industries, companies, and public agencies, integrating the several components necessary for the provision of a full waste solution. 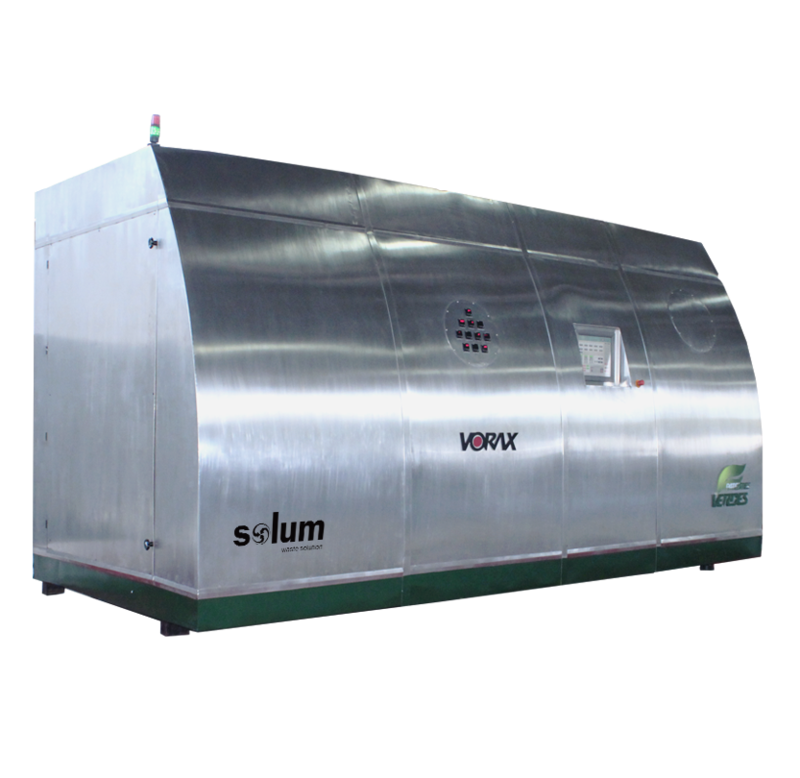 Learn more about the company and the innovative machine VORAX by accessing the menu. Does not process the waste in the excessive presence of air, considerably reducing the production of pollutants that need to be treated. Does not produce cancerous molecules that need a lot of oxygen to be formed and gases to be treated. Does not form ashes, a toxic by-product that is always present in the conventional processes. The process is fully automated, which makes the equipment operation very simple. Vorax - UTR DuoTherm, which is Solum main equipment, can process solid wastes of any class, based on an innovative technology that generates a temperature gradient produced by two thermal sources. It is a dry-distillation process that consists in heating the waste and resulting in three fractions of different physical states. Does Vorax treat which type of wastes? The machine can treat all types of waste, since they are tested and adjusted according to the necessity and the waste behavior, paying special attention to the 100%-liquid wastes, which will be treated in another reactor that is more appropriate for treatment of liquids. Will the machine produce ashes, dioxins, or furans? As there is virtually no atmospheric air in the process, there is no formation of cancerous molecules such as dioxins and furans, which need oxygen to be formed. Besides, the gases to be treated (proportionally in a small quantity) suffer a treatment process that prevents the synthesis of harmful molecules such as dioxins and furans. Regarding ash formation, it is avoided due to the high temperature levels of the work process. Thus, there is no toxic by-product, differently from what happens in the incineration process. What does happen is the transformation of particulate residuals (like ash) in iron or ceramic matrices, not being necessary the use of other disposal methods. Will the gas-formation rate be low? This is a waste dry-distillation process, with absence of air and without waste combustion, which allows the extreme reduction of the quantity of exhausted gases, when compared to conventional processes.